This promotion is reserved for UOB Credit Card issued in Thailand, with valid membership status and good payment on the date until which UOB will upload extra point. This promotion is only applicable for booking designated hotels which participate in this promotion, the participate hotels will show a “PROMOTION ELIGIBLE” banner in the search page. This promotion is only applicable for booing with pay in advance or pre-paid only. 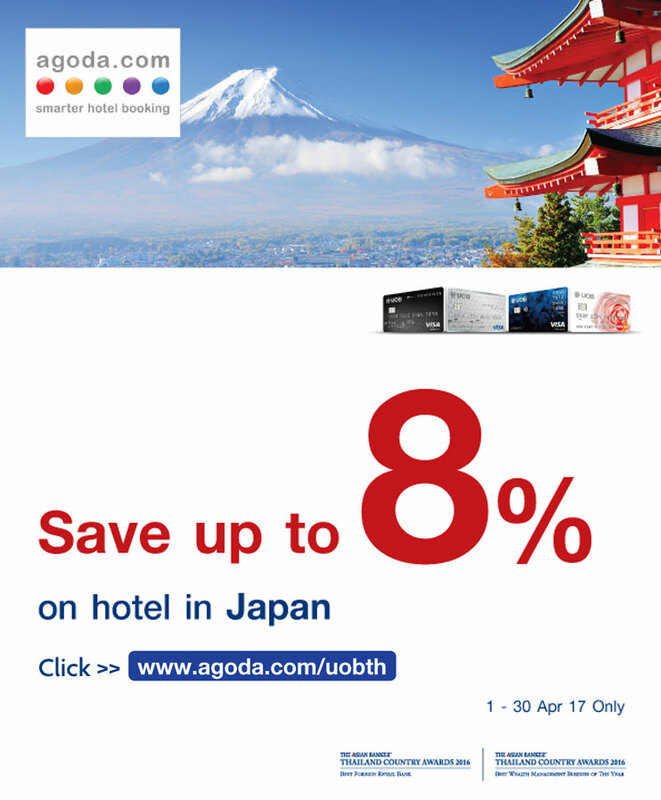 The designated hotels which participate in this promotion will show “UOB discount” once the user inputs UOB credit card number. The discount is applied to the full payment at hotels or when check-out of the hotels, exclude post-pay type of hotels. The discount is applied to the room charge only (exclude local tax, service charge and other fees). The discount cannot be transferred or exchanged into cash. This promotion is non-transferrable, accumulative, or applied with other promotions, rooms on sale, or fixed price rooms (except clearly identified). Agoda and UOB reserve the right to make changes in terms and conditions without advance notice. For any dispute case, Agoda's decision is final.